Site: Likes moist, well drained, alkaline soil rich in nutrients. Does not do well in well manured soils. Does well in full sun or partial shade. Water frequently, but it will not die if it goes dry. 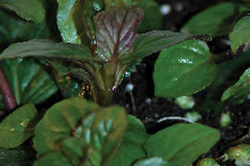 Growing: Plant pieces of root 2 inches deep and 9 inches apart in autumn or spring. Top dress with compost in autumn if the plants are not lifted annually. Thin or transplant plants to 12 inches apart into large pots or polyethene bags to restrain invasive roots. Mint can easily take over your herb garden. (If rust appears, the plant must be dug up and burned.) Don't be afraid to cut and prune, even right down to the soil. This can be a couple of times a year, to keep it from going woody. Harvesting: Pick leaves of this herb plant just before flowering. The best leaves to use are the top bud and first two leaves; pinch out the growing tip rather than cut a whole stem. 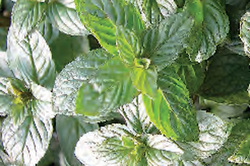 Culinary Uses: Peppermint's sweet, strong mint flavor is good for many candies. Spearmint's flavor is stronger but less sweet than peppermint and and along with Bowles mint is the variety used to make traditional mint sauce for lamb. Corsican Mint which is mat-forming ground cover that can be walked upon, releasing its creme de menthe fragrance is often used to flavor liqueurs, along with peppermint. Fresh leaves of mint may be added to tea for a refreshing drink or to brighten potatoes, peas and fruit salads.